At which point some colleagues pointed out that this is not the correct approach and I should not alter the "default" runtime configuration, I should instread add simple classpath entries that point to the jar in the wildfly modules. rob.stryker is your man. Dare to enlighten us Rob? I think I might have a clear idea after reading https://docs.jboss.org/author/display/WFLY/Developer+Guide#DeveloperGuide-ClassloadinginWildFly, please correct me if I'm wrong. Those default classpath entries come as predefined for the WildFly x.x.x. Runtime because of JBoss Tools and if I understand correctly they are the list of all the implicit module dependencies. Now you can of course amend that list in your Eclipse in a number of ways however you should be careful when dealing with modules shipped with WildFly. As the developer guide explains, depending on the jboss.api property value(presence) it might not be advisable for the application to specify a module jar in the dependencies. In the specific case highlighted, jackson core / databind / annotations don't have a jboss.api property at all in their module.xml which makes them public, if I understand correctly that means you're welcome to include in your dependencies the jackson version inside WildFly; it will continue to be available in future releases and it should not have incompatible API changes within the same major series (which is good). The problem with adding jackson dependencies in that way (i.e. 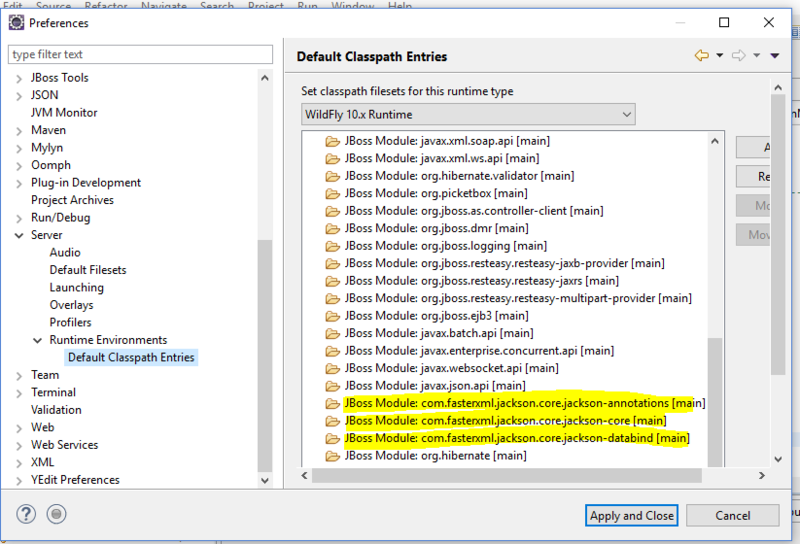 modifying the default classpath filesets for WildFly Runtime in Eclipse) is that your jackson dependency is not in any versioned artifact. I.e.